Music and video by Dave Black & Cylvi Manthyng from a road trip north from Perth, Western Australia. Kalbarri is a small town of just over a thousand people, known for its rocky coastline, red landscape, spring flowers, and pounding surf. This entry was posted in 2013, 2015, Australia, Music, Travel, video and tagged acoustic, acoustic guitar, Australia, banjo, Cylvi M, didgeridoo, experimental, folk, Geraldton, Indian Ocean, Kalbarri, road trip, surf, Western Australia. This entry was posted in 2014, Australia, Music, video and tagged Australia, Cylvi M, Family & Friends of Missing Persons Australasia, human statue, performance art, Perth, shakuhachi, Western Australia. 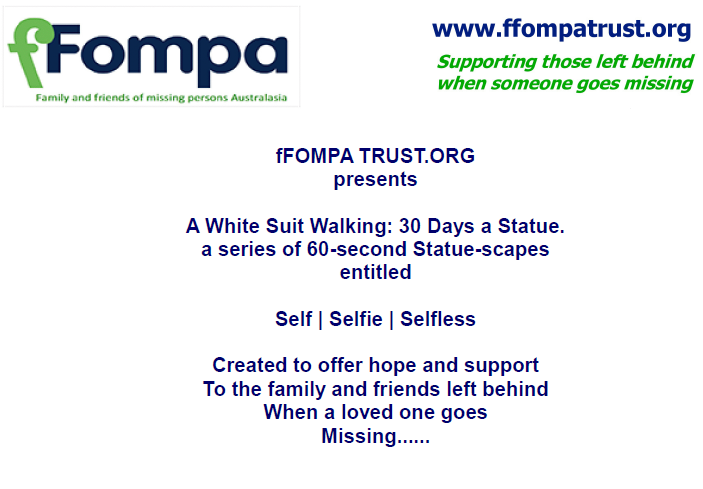 Supporting the Family & Friends of Missing Persons Australasia – a special event in Perth, Western Australia. This auction is to raise awareness and support in its objectives – to educate, to inform, and to help support those people left behind when someone goes missing. This entry was posted in 2014, Australia and tagged art, auction, Australia, avant-garde, charity, colourful, Cylvi M, eyeballs, Family & Friends of Missing Persons Australasia, fFOMPA, ffompatrust.org, glitter, mirrors, missing persons, painting, paintings, Perth, Western Australia.